We get a lot of questions here at Capacitron. Like: “What is it that you say you do again?”, “Who dresses you?”, “Why are you so funny looking?”, “What is the answer to life the universe and everything?” and “How do you pronounce your name: Capa…capa…what?”. Here is our long winded, (we believe creative) and perhaps ego stroking answer to the latter question. So, what’s with the name “Capacitron”? 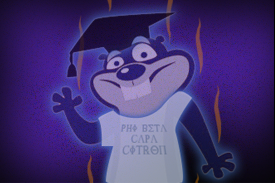 Capacitron IS NOT pronounced (kapa•sit•trän) and therefor should not be confused with any type of fraternity such as “Phi Beta Capa Citron”. Nor should it be confused with an orange scented Beaver Spirit of the Lakota Indian Tribe. Of course, this would make for one really awesome fraternity. Capacitron IS pronounced (kə•pás•ə•trän) but it is not a sentient robot and should not be confused with any of the Transformers like Megatron or Galvatron. (Although we feel we should be an integral part of Paramount’s next Transformers movie). Capacitron can also be found in old dictionaries and refers to a device used to irradiate food making it so-called “safe” for human consumption. (We do not necessarily agree with the idea that it is safe nor do we believe in irradiating our edibles). “The Capacitron” can be found on Wumpa Island in the video game “Crash Mind Over Mutant”. It’s the first component Coco needs in order to convert the Doominator Eye into an entertainment system. Glad to be of assistance Coco. We love transforming evil stuff into good things that entertain. “The Capacitron” is also a device that helps one make it to the moon (as long as it’s not covered in chocolate ice cream). You can listen to the drama play out on an EP called Rocket Surgery by the Martin Brothers. Yo Martin Bros. You gotta keep your capacitron clean dudes. Take it from us, we know. Capacitron is also a company in San Francisco that makes the awesome Firefly guitar pick that enables you to put on your own private light show. Currently they are running a Kickstarter campaign. Get over there and help fund em! Capacity: The power and ability to absorb and retain knowledge in order to provide the maximum possible benefit. Whether it be for print or web we are here to help your business achieve the maximum possible benefit from our brand of creative insight. See ” Design & Creative Stuff” or “All WordPress” for specifics or just Contact Us and we’ll tell ya all about what we can do for you.